I finished the hem just in time on Saturday evening, then I immediately had to jump in the shower and head out to a dinner with friends where the Cosmo made it's official debut. 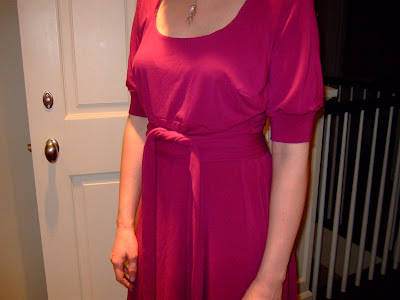 I like that this style easily lends itself to design changes in the neckline & sleeves. It's a classic style that will be wearable for years to come. The body skimming style is very flattering. 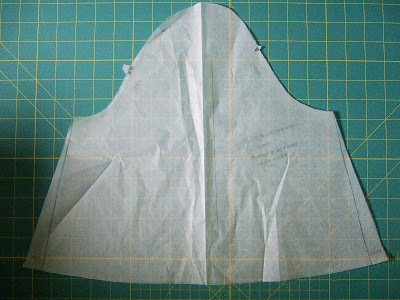 Bodice: I outlined my bodice changes in a previous post. Sleeves: I drafted an armband to fit just above my elbow, and I shortened the sleeve pattern piece and widened it 1'' on either side so I could gather them onto the armband. If I were to do this again, I would make them even wider at the bottom for fuller bell effect. 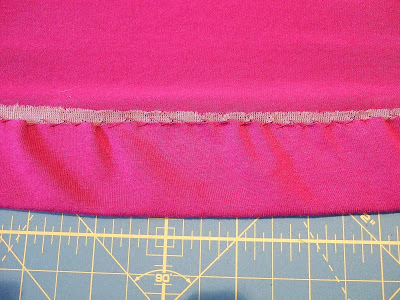 Hem: I finished the hem invisibly by fusing a 1.5'' wide strip of interfacing just above the hemline, then I turned up the hem and sewed the hem to the interfacing with a catchstitch. Absolutely! You can't help but feel like a million dollars in this dress. I am 100 PERCENT IN LOVE WITH THIS. Yes, I know I'm shouting, but that's how fantastic I think it is. Girl! I want to go home right now and redraft my pattern to steal this look. OMG! It looks so good! That color is fabulous on you! I hope when you put that on, you went some where great to show it off! This is so cute! I love the color on you too - it's perfect. Beautiful! Love the color on you too! You look like a million dollars in that dress. I have loved every dress that everybody has made from this pattern. I am just going to have to whip one up soon! Looks beautiful on you! You did a wonderful job!! Hope you had fun when you debuted it!!! I love this! The dress is gorgeous. You did a really good job. You did a great job...it's so flattering on you and I bet you'll wear it often. That looks beautiful on you! I've been trying to decide if I wanted to buy this pattern or not, but you've convinced me! Your dress looks really great! And I really like what you did with the sleeves--a big improvement over the original. i love how this looks on you! it looks soo well made!!! ugg, just adding more fodder to my need to go out and buy this pattern!